Yep, sometimes life is not fair. But there’s a difference between not getting a job and having your pension fund looted by a weasel. What would it take for you to take action after all legal means of redress have failed—and if the judges and or cops were the bad guys? These 21 stories examine what pushes people over that line. In the introduction, Lee Child describes how these stories were selected, and has a nice word for each author. He confesses the hardest part was not soliciting the tales, but writing his own contribution to the collection. Don’t worry—his story is quite good. Four of the stories deal with religion—perhaps a natural target for an institution that is seemingly beyond the law. 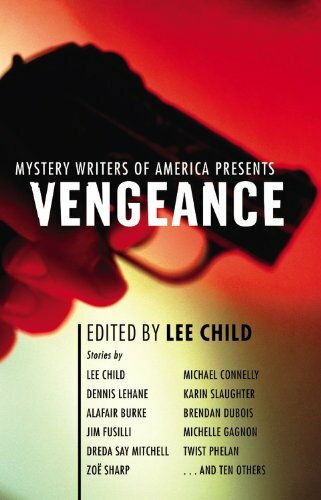 No surprise, the best stories are the ones by big-time authors: Michael Connelly, Brendan Dubois, and Dennis Lehane. My favorite is “The Consumers” by Lehane because it’s got an O. Henry ending. You think you know where the story is going, but there’s a killer twist. Ditto for “The Unremarkable Heart” by Karin Slaughter. Read the Connelly before you commit a crime—his detective Harry Bosch points out the “tells” of his suspect and how Harry knows she’s lying to him. “Lost and Found” by Zoe Sharp is about withholding the one thing the victim begs for at the end of his life, the one thing he craves, and the killer knows it—and refuses to give it.